"The name of Ernest Elliott is one that is linked with a distinct novelty. 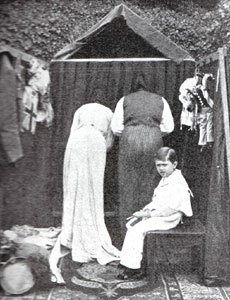 On stage proper, he has his own separately equipped miniature stage and thereupon, he offers Human Marionettes, which must be seen to be credited." 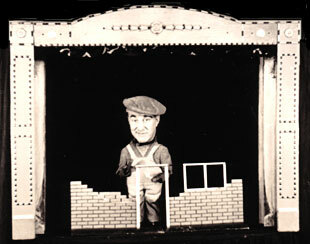 One of the first entertainers to appear on television, Ernest Elliott performed his humanettes for 35 years, including 35 broadcasts in the early days of the BBC, a performance for Princess Margaret when she was aged 7 and appearances all over the country in Summer Seasons, Music Hall and Variety. Ernest lived all his life in Market Harborough. His aptitude for entertaining others, showed itself when, as a schoolboy of 12, he entertained his fellow pupils at school functions. At 15, he showed great promise as a ventriloquist, but it was when he turned professional that his true skill with humanettes came to the fore. "It was a terribly busy life," he said in a newspaper interview in 1970, "In the Winter I travelled 2000 miles a month, but I enjoyed the work - I ate, drank and slept it." His main repertoire, which he wrote himself, featured as many as 80 characters including a Bricklayer, a Sheik with his Camel, a Goalkeeper and a Musician playing "Poet & Peasant" on Tubular Bells. During his show-business career, Ernest wrote the words and music to over 250 songs - one of which, "The Song of the Tinker," was recorded on HMV by Peter Dawson. Ernest entertained professionally until 1957, except for a period during the 1914-18 War, when he served as a Naval Physical Education Instructor. Following his entertainment career, he returned to the family business and became a partner in a Gentlemen's Outfitters in Market Harborough, a shop which was in the Elliott family for 98 years. He was also a Church Organist, a position which he held for 60 years and even while touring, he returned home to Market Harborough on Sunday Mornings, whenever possible to carry out his duties as organist at the Congregational Church, where his Father had been the organist for 25 years before him. 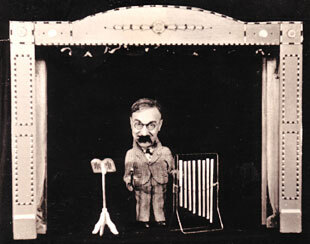 Below are pictures from 1903 of a much earlier exponent of "Living Lilliputians" - DAVID DEVANT - seen here showing "how the figures are worked" and "behind the scenes during a performance." 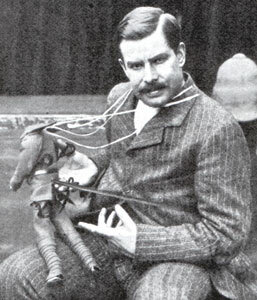 Much better known as a Stage Magician at the height of the Music Hall period, David Devant (1868 - 1941) was also a skilled performer with Humanettes. As one of the country's finest stage illusionists, he appeared in three Royal Command Performances. He was forced to retire from show-business in 1920 due to ill health.